The student directors Syndey Grover, Luis Monterio, Hannah Mainor, Taylor Weber, Skyler Murphy, Kayleigh Roberson, and Shelby Lupton pose for a photo with their scripts. 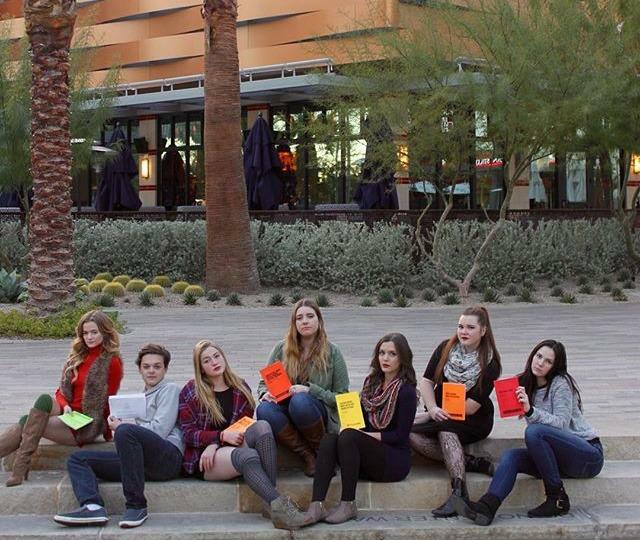 Each year Palo Verde’s theatre presents student directed one act plays, and this year they had seven one acts split into two nights and featuring a variety of hilarious and sometimes “deadly” serious characters, with intriguing plot lines. The first one act was directed by senior Sydney Grover on Thurs night, and was titled “Campsite Chaos: A Frantically Romantic Love Story” by Ken Preuss. With her leads junior Lily Scarbrough and freshman Adam Arviz, playing Zoe and Perry, a slightly awkward nerdy couple, who takes a retreat in the woods, goes wrong, and who wouldn’t be distressed when flamboyant characters like “Little Red Riding Hood”, “Robin Hood”, a hippy, a clown, a group of girl scouts,a lumberjack, a scientist, and much more, intervene on your perfect night. This provided with a good amount of laughs and “awww how cute” on the audience’s part, Grover hit the nail on the head with her props, set, and well-rehearsed actors. The next one act of the night was “Ruby of Elsinore” by Bruce Kane, directed by Luis Monteiro, and was a hilarious satire and play on of Shakespears “Hamlet.” Led by Kyra Bracamontes playing Ruby, a hairdresser who seems to gets all the gossip in Elsinore, whether she enjoys it or not. With witty one-liners that left English teacher’s rolling with laughter, and comical facial expressions, made this piece entertaining, and a joy to watch. Monteiro’s more genuine approach to directing his actors was apart of what made the show so special. The third one act included crazy characters and death itself. “Cheating Death” by Kamron Klitgaard, was directed by senior Hannah Mainor, and had an insane cast full of kooky personalities, including an “idea-man”, “a wisher”, a paranoid man, a diva, a “I’m right all the time and you’re wrong, and a Sam Johnson. Not to mention the callous Death, played by Ashley Vuyk. With a good mixture of comic relief and deep messages, this one act was carried well by it’s cast of psychopaths and was filled with insightful and hilarious lines. Mainor for sure picked the right script. “I loved working with my cast so much. My one act took place inn an asylum, and it was especially ch alleging and exciting to have each of my actors portray a mentally insane patient. They did an amazing job and I couldn’t be more proud!” said Mainor. After intermission, the last one act of the night went on, directed by senior Taylor Weber, “High School Musi-Pocalypse” by Don Zolidis. A dark and uproarious twist on the original Disney movie, including a persistent lawyer, played by Isabelle Colletti, and a romantic duo, seemingly similar to Troy and Gabrella, Cory and Alejandra, played by John Ronia and Alexandria Truelson, this one act left audience members amused by the convivial characters. Weber’s adorable personality and adorable picked one act defiantly stood out, in the both the performance and set. “It was an absolute pleasure to direct, my cast was amazing! They’re so talented, and it is such a great ending for my high school theatre career,” said Weber. Friday night opened with Skyler Murphy’s one act “The Final rose” by Bekah Brunstetter. This one act makes fun of reality TV shows and how they ploy the audience with unrealistic ideals. Led with Jeremy, Sean Havens, bachelor TV heart breaker, is forced to choose between his one true love and a stunning show. Filled with exhilarating lines this one act made for a great show. The second one act for Fri. night was “Action News: Now with 10% More Action!” by Jonathan Rand, directed by senior Kayleigh Roberson. A daring piece packed with lively quick pace turns and uproarious remarks from characters like: Babs Buttlebee, played by Emily Felger, and Jim Pickles, played by Jeb Jurinek, take the stage with interesting and hilarious stories of apocalyptic status reports, super cute but killer puppies, and a grumpy old man. A well produced play on Roberson’s part with actors hitting just the right queue for hilarity, “Action News: Now with 10% More Action”, will leave an everlasting effect of how you watch the news. The final one act was directed by senior, Shelby Lupton. A gut-bursting one act about fast food workers who scrammed to clean up dirty rats, and fill their burgers with actual meat, because believe it or not people don’t actually like mystery meat… at least not the health inspector. Among the chaos their manager is found dead in the freezer, which would defiantly score them a “F.” Not to mention they have a tapeworm named “Squirmy” played by the giddy Vincent Maldonado. Lupton has always done well on the stage, and seeing her translate her skill to her actors to make a great one act shine was sensational. “Directing is a whole different ball game from acting or teching, I absolutely love it! It’s crazy fun and I would love to do it again,” said Lupton.